At ALDE in Paris on Wednesday, March 20, Éditions Originales du XIXe au XXie Siècle, in 298 lots. Among the top-estimated lots are first editions of Stendhal's La Chartreuse de Parme (€30,000-40,000) and Le Rouge et le Noir (€20,000-30,000); a twenty-volume edition of Balzac's works, bound by Victor Champs (€10,000-12,000); and a five-volume set of Poe's works (Paris, 1856-1865), translated by Baudelaire (€3,000-4,000). Swann Galleries sells 256 lots of Autographs on Thursday, March 21. Expected to lead the way at $20,000-30,000 is a May 1776 letter from Joseph Brant (Thayeadanegea), written to an unknown correspondent from Falmouth as Brant prepared to return to America after being in London. Other interesting lots include a 1950-1956 guestbook from New York's Luchow Restaurant ($8,000-12,000); and six letters from Princess Diana to editor Elizabeth Tilberis ($5,000-7,000). Also on Thursday, PBA Galleries holds a Fine Literature sale, in 366 lots. 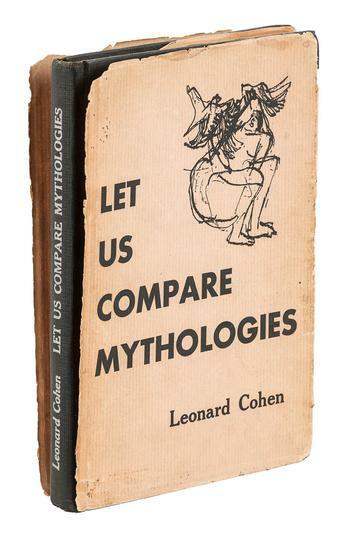 A presentation copy of Leonard Cohen's first book, Let Us Compare Mythologies (1956) rates the top estimate, at $8,000-12,000 (pictured above). A first edition of A Wrinkle in Time, with the first state dust jacket (1962), could sell for $3,000-5,000, and a collection of sixty-eight typed poems by George Sterling is estimated at $2,000-3,000. A copy of the first American edition of A Study in Scarlet (ex-library in a modern fine binding) could also sell for $2,000-3,000.